Commonly available discharge devices are mostly ineffective for cohesive and fibrous products. In most instances, dischargers and feeders have a tendency to introduce high shear and compaction into the product, creating high consolidation and conglomeration of the product. In addition, improper hopper design also aids to unfavourable product flow regimes. The results of these outcomes are operator safety issues, high costs of hopper manufacture and poor plant performance. To solve these common issues, Industrial Powder Technology, has developed the Siletta Multifunction Discharge systems. A total of 40 years of development into the design of the Siletta has been undertaken and systems have been used in Europe since 1974. The discharge and blending technology is quite unique and can accommodate the most extreme range of product flow properties – designed for cohesive, fibrous and free flowing products which have a tendency to be difficult to handle. The internal design of the Siletta Dischargers is mathematically modeled, based on the testing of the bulk solids flow characteristics. Importantly, the design characteristics of the multifunctional Siletta systems is that it has the capacity to alter product flow regimes from ideal flow, mass flow, funnel flow and eccentric flow, to suit product handling characteristics. The design is such that product above the dischargers is uniformly dilated throughout the full area of the discharger and effectively breaks arch formation in the product. Product discharge is vertically downwards, therefore avoiding contribution to high shear and consolidation stresses into products. Accommodating a wide range of industries and products, the Siletta multifunction dischargers can handle maximum lumps of 200mm, right the way down to fine products measured in microns. The original Siletta discharger was designed to handle coal with a lump size of 200mm. Standard sizes to suit round (up to 5.0m dia) or square (down to 100mm) hopper openings are available, and special sized units can also be designed. 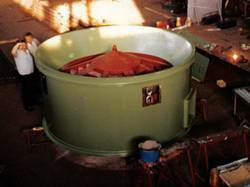 Industrial Powder Technology is represented in Australia by Bulk Handling Global Pty Ltd.